4 Bedroom Detached House For Sale in Tonbridge for Guide Price £1,695,000. The entrance hall has a tiled floor, which continues throughout the ground floor, opens to a small snug with outlooks on two sides. The sitting room has great charm with its fine Inglenook, fitted book and display shelves, good ceiling heights and outlooks on two sides. The dining room has a fitted oak dresser, a double aspect outlook and opening to the well fitted and equipped kitchen with its granite work surfaces, numerous bespoke cupboards, a plate rack and small breakfast bar. This opens to the utility room/side lobby with plumbing and space for washing machine and tumble dryer and door to outside. On the first floor there is an attractive landing with exposed timbers and stairs continuing to the top floor. The delightful principal bedroom has original polished oak floorboards, a range of wardrobe cupboards, lovely views and an en suite shower room. There are two further bedrooms on this floor, one with triple aspect outlooks and there is an excellent family bathroom and separate shower cubicle. On the top floor is the enchanting fourth bedroom with a vaulted ceiling, skylights and window to side. Individual features such as the leaded light windows, latch doors and beams all add to the considerable character of the house. The detached, converted barn has a large reception/games room open to the full roof height with windows on two sides and French doors to a decked terrace overlooking the swimming pool. There is also a wood-burner and cupboard containing a sink and drainer with cupboard under. There is a shower room with W.C. and on the first floor the galleried bedroom/studio overlooks the reception room and also enjoys countryside views. 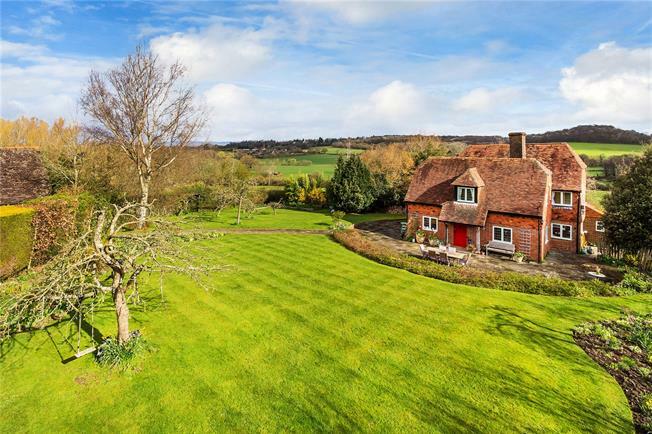 Set off a country lane amidst beautiful rolling Kent countryside, Little Poundsbridge is situated in a triangle formed by the attractive villages of Penshurst, Fordcombe and Speldhurst. The Spa town of Royal Tunbridge Wells is about 4.5 miles and provides a comprehensive range of shopping facilities, restaurants and recreational amenities. Tonbridge is about 5 miles for further shopping facilities and mainline railway station. There are highly regarded schools in the area both private, grammar and independent in Tunbridge Wells and Tonbridge plus preparatory schools and in the villages recommended primary schools. The house stands in very attractive mainly South and West facing, well maintained colourful gardens with good areas of lawn, well stocked flower and shrub borders and by the house an excellent large paved terrace. The fine heated swimming pool is set in a sheltered, enclosed lawned area with surrounding paving with the converted barn to one end. Beyond the formal gardens are an orchard, grassed areas leading down to two ponds with a stream and a chicken run. Beyond is a post and rail paddock with easy access to the stable block. In all about 9.5 acres. Penshurst 1.5 miles – Tunbridge Wells 4.5 miles – Tonbridge 5 miles – Hildenborough Main Line Railway station 5.9 miles (London Bridge 34 minutes) - Gatwick Airport 23 miles - A 21 15 miles for direct route to M25 – London 38 miles.